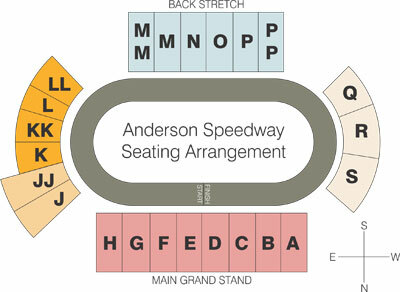 Tharp Scores FWD Oval Victory - Anderson, Indiana Speedway - Home to the World's Fastest High-Banked Quarter Mile Oval! 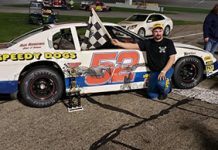 Josh Tharp was subbing for regular Front Wheel Drive Oval Division driver Billy Hooten and he took the car to multiple wins on Independence Day at Anderson Speedway. 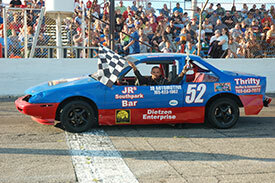 Tharp took the point from the fourth row when Dylan Hoppes and Jared Keller got off to a slow start on the opening lap. He was chased by Jerry Dane and Jeff Williams. Williams got inside of Dane coming off the fourth corner and Randy Hoppes made a similar move on the next circuit. 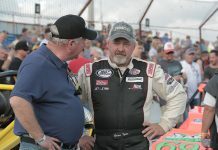 The first of two caution flags waved on the third lap when Lawrence Kelly Jones spun in turn four and a lap later the second yellow flag waved for debris. On both restarts Tharp was able to maintain the lead over Williams with Dane fading getting passed by the father and son duo of Randy and Dylan Hoppes. The finishing order got scrambled on the final lap when Randy Hoppes and fast qualifier Jared Keller got together in turn one with both drivers coming to a halt on the infield grass. Tharp won by .4-seconds over Williams with Dylan Hoppes, Marshall Clark Jr. and David Powell rounding out the top five. Williams won the first heat race passing Dane on the third lap with an outside pass entering turn three. Dylan Hoppes, Jared and Andy Keller rounded out the top five. Tharp had to work his way up through the field to capture the second heat race taking the lead on the third lap when early leader Lawrence Kelly Jones spun in turn one. Following the restart Tharp drove away from the pack for the victory with David Powell, Devin Lane, Jones and Clark rounding out the top five. Jared Keller posted his fourth quick time of the season and third in a row with a lap of 15.446-seconds.